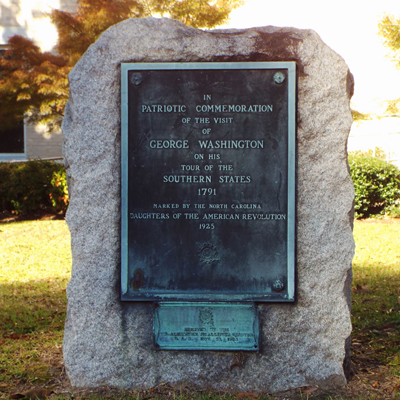 The marker commemorates President George Washington’s visit to the area during his tour of the southern states in 1791. It consists of a two simple bronze plaques attached to a roughhewn granite block several feet tall. The larger upper plaque contains the primary inscription and is identical to the plaques in Tarboro, Hampstead and Guilford Courthouse. The smaller bottom plaque provides dedication information. In addition to the inscription, both plaques have the spinning wheel and distaff insignia of the Daughters of the American Revolution. 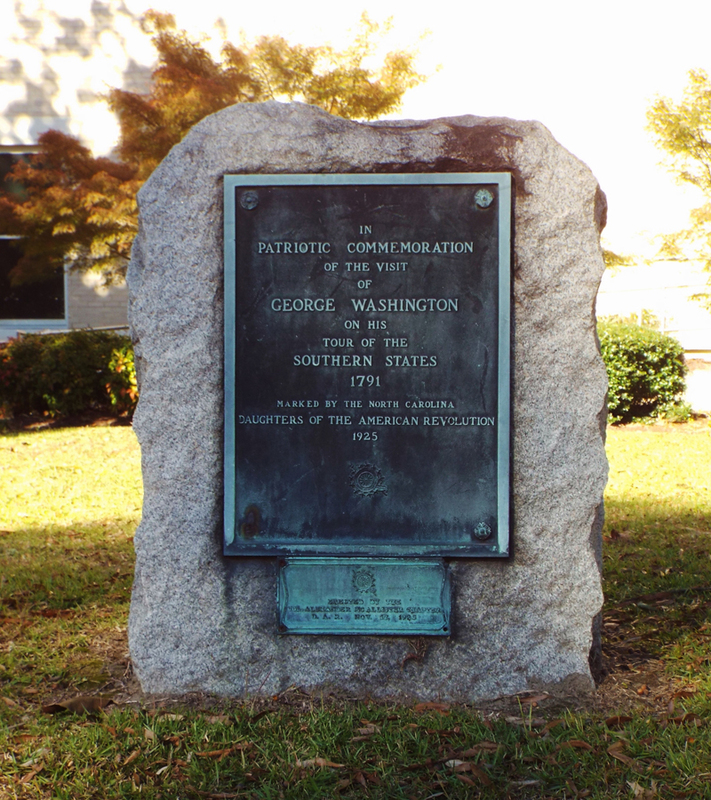 There are several stone markers across North Carolina that commemorate President Washington's tour of the southern states in 1791. Notable among them are George Washington Tree Marker in Hampstead outside Wilmington, George Washington and Henry Clay Marker in Wilmington, George Washington Boulder in Lexington, commemorative plaque in Tarboro, "George Washington Stopped Here" Marker in Arcadia, and a stone marker at Guilford Courthouse. The monument sits near the sidewalk in front of the Pitt County Courthouse to the left of the entrance. A small memorial to Pitt County Peace officers is nearby. To the right of the courthouse entrance is the Pitt County Confederate Monument. The courthouse is located at 100 W. Third Street in Greenville, NC. The marker stands on the front lawn under a mature shady tree.